A well-designed trade show booth can bring your business in the limelight at trade shows. Certainly, being the center of attention at trade shows will connect your business with more prospective customers, increasing sales. On top of that, your business relations with existing customers will get a boost. What’s more, a trade show booth can even improve your brand image, adding value to your products and services. However, traditional booth designs and lack of strategic planning are ineffective. As a result, many businesses fail to achieve high return on investment at a given trade show event. But, with a little more planning and attention, you can easily enhance the effectiveness of your trade show booth. This post gives you vital tips to get moving in the right direction. An outstanding trade show booth can help you get ahead of your competitors in terms of footfall and lead generation. Investing in a booth design that instantly grabs attention of prospective customers is a great idea. Even better, you can find a flexible design which can be reused multiple times. Additionally, great design can customize the size of your trade show space without compromising on appearance or functionality. These types of trade show booths can fit into small, medium or big spaces, letting you control the footprint. Surely, a versatile booth design will enable your business to stand out from the crowd. In order to have a successful trade show booth, you want to be sure to arrange products in an organized fashion. This may seem like a small detail. However, it is one of the easiest steps you can take to ensure that your trade show booth appearance is enticing to potential clients and customers. Make sure to arrange table displays in size order. Put larger items in the back and the smallest items in the front. This makes it easy for passers-by to gain an idea of your product offerings at a glance. That makes them more likely to stop by your booth if they see something they like. Trade show booth product arrangement is a small detail that matters for producing happy customers. Do not forget it to keep this in mind for your table displays. The shape and size of a trade show booth depends on the location at the venue. Depending on where you are set up, trade show organizers usually offer prime spots at a slightly higher charge. However, paying a little extra can considerably improve your chances of getting more customers. When choosing, try to select a trade show booth location that gets high traffic. It is advisable to survey the trade show grounds in advance to select the most convenient location. Generally, the corner spots are known to get more footfall. Of course, you should try to select a corner location as it will give better opportunity of receiving the most exposure. It is not always necessary to select a huge trade show booth. The size of your trade show booth should be equivalent to the display space you need, just as is the case with mall kiosks. Nevertheless, smart organization can make even a small trade show booth more highly profitable. To prevent wasted space, you can calculate the number of products which will be showcased, determining how much space is really needed. Added to that, you must decide the number of employees who will be present in the booth. The size of your trade show space should be dependent on price, products and people required to make the event a success. Next, a visually appealing trade show booth can easily attract prospective customers. 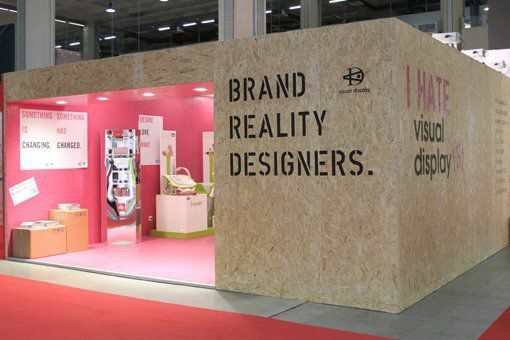 To make your trade show booth look good, you can use bold colors, classy designs and legible signboards. Furthermore, you can utilize clear images relevant to your business that customers will easily notice. Optimal lighting is another way to make the booth look good. Appropriate lighting can stop prospective customers from overlooking your display. Surely, a good looking trade show booth is bound to drive traffic to your business, so you may want to consider outsourcing services related to this endeavor. If you truly want to make your trade show booth the best looking at your next event, you may want to consider purchasing modular displays from a third-party distributor, like TradeShowPlus or similar. This is a much better option than just researching brochure layout ideas. These companies provide tabletop displays, banner stand displays, outdoor displays and many other trade show accessories. All you have to do is upload your artwork and start shopping. If you want to make your booth look the best it can, you may want to consider leaving the displays to a third-party specialist. A trade show booth usually serves multiple marketing functions. The design of your trade show booth should allot specific areas to conduct marketing tasks. For instance, if you plan to give your customers a live demo of a new product, then there should be a demo area available. If you plan on closing sales, you can have a table a chair ready for signing documents. Designating separate spaces to perform different marketing tasks makes a trade show booth functional. Selecting trade show booth design based on functionality helps in increasing your return on investments. A trade show booth can be effectively used in promoting your new products, improving public relations and acquiring new customers at events in NYC and elsewhere. To achieve these results, selecting a flexible and functional trade show booth design is essential. By all means, the right trade show booth will make participating in trade shows more worthwhile.